Scoring helps you qualify contacts and prioritize them for outreach. With contact scoring, you assign points to your contacts based on certain qualifying criteria, like demographics (e.g. location) and behaviors (e.g. web activity). The higher the score, the more qualified the contact. Your HubSpot score is a contact contact property, but it lives separately from all the rest of your contact properties, in its own walled garden. With today's change, your score lives with the rest of your properties. Now, "score" is a property type, just like “dropdown,” “checkbox,” or any other. As a result of that change, if you're an Enterprise customer in any HubSpot hub, you’ll be able to create up to 25 scoring properties for contacts. As an added bonus, if you're a Professional customer in any HubSpot hub, you'll be able to create one score property (previously, only Marketing Hub Professional accounts had this capability). Add your positive and negative attributes --- just like you did in the old setup --- and save your property. The property will appear on the contact record, in whatever section you chose during setup. Note: Scoring's previous home --- “Lead Scoring,” within Settings > Marketing --- will be removed eventually, but not as part of this rollout. If you have one audience, a single score suffices. But as your company scales, you’ll sell to new audiences. You might expand into new product lines, new regions, or new personas. You might focus more on upsell and cross-sell of existing customers. If your contacts aren’t “one size fits all,” your scoring system shouldn’t be either. Fit vs. Interest. Your sales team wants to evaluate customers on both fit (i.e. is a contact in the right region? The right industry? The right role?) and interest (e.g. how engaged have they been with your online content?). With multiple scores, create both an engagement score and a fit score, so that you can prioritize outreach to contacts whose values are high in both categories. Multiple personas. Say you're a software company that sells two different types of software, via different sales teams, to different buyers. You could create a score for a buyer's fit and interest in each tool, and use the respective scores to route leads to the right sales teams. New business versus upsell. As you grow, you might start to focus on upsell or cross-sell as much as new business. The signals that indicate quality for prospects and existing customers might look completely different. For prospects, you might look at demographics and website engagement, whereas for existing customers, you might look at support ticket volume, engagement with an onboarding consultant, and usage of your tools. If buying signals look different for different types of sales, consider creating multiple scores. With today's change, if you have an Enterprise account of any HubSpot hub, you’ll be able to create up to 25 scoring properties for your contacts. 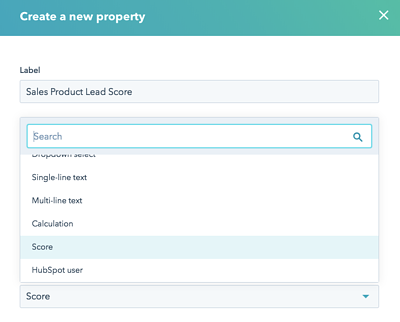 If you're a Professional account in any HubSpot hub, you'll be able to create one score property (previously, only Marketing Hub Professional accounts had this capability). Ready to start scoring? Create a new contact score property now.